Case in point, the dirt cheap 32 GB eMMC SSDs [Jason Gin] recently scored. Used by Hewlett Packard on their line of budget laptops, he was able to snap up some of these custom drives for only $12 each. Only problem was, since they were designed for a very specific market and use case, they aren’t exactly the kind of thing you can just slap in your computer’s drive bay. He had to do some reverse engineering to figure out how to talk to them, and then some impressive fine-pitch soldering to get them plugged in, but in the end he got some very handy drives for an exceptionally low price. [Jason] starts by figuring out the drive’s pinout using the cornerstone of the hacker’s electronic toolkit: the multimeter. By putting one lead on an obvious ground point such as the PCB’s screw holes, you can work through the pins on the connector and make some educated guesses as to what’s what. Ground pins will read as a short, but the meter should read power and data pins as a forward-biased diode. With a rough idea of the pin’s identities and some luck, he was able to figure out that it was basically a standard SATA connection in a different form factor. To actually hook it up to his computer, he pulled the PCB off of a dead SATA hard drive, cut it down to size, and was able to use fine magnet wire to attach the conductors in the drive’s ribbon cable to the appropriate pads. 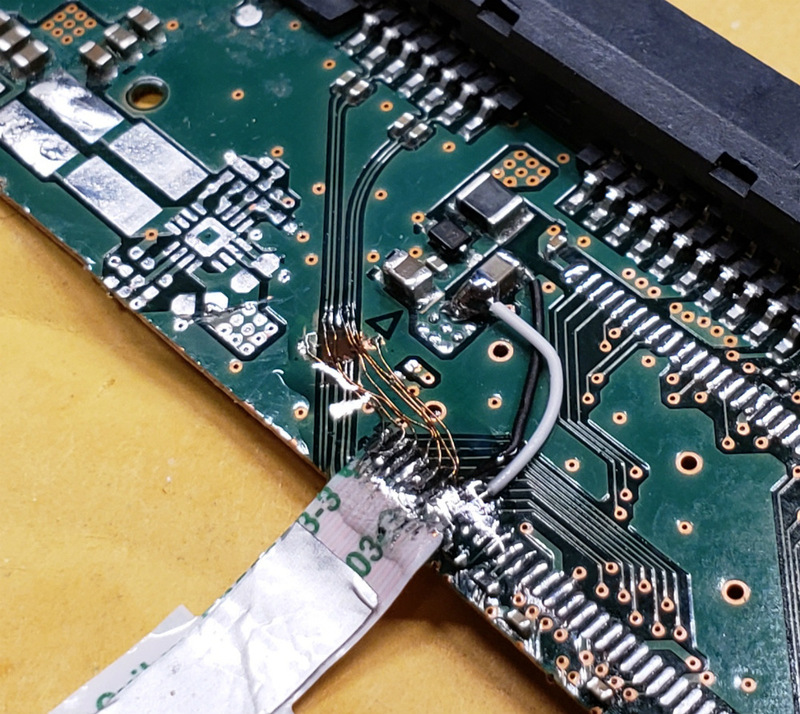 He sealed everything up with a healthy dose of hot glue to make sure it didn’t pull loose, and then ran some drive diagnostics on his cobbled together SSD to make sure it was behaving properly. [Jason] reports the drive isn’t exactly a speed demon, but given the low cost and decent performance he still thinks it’s worth the work to use them for testing out different operating systems and the like. [Jason] seems to have something of an obsession with eMMC hacking. Last time we heard from him, he was bringing a cheap Windows tablet back from the dead by replacing its shot eMMC chip. Good working out he could use these modules but got to say what a mess you made wiring them up. Should of come up with a better plan. Also what can you do with 32gb these days ? Not much. Always SSD hard drive are becoming cheaper now. Even better than that, you could fit a full fledged Linux Distro with some games and lots of programming tools. You could just install the root directory on that 32gb SSD and the home directory on any HDD. Either way, I am not gonna risk my precious files on a second hand drive living upon a fragile BGA-like soldering by human. BGA? There is no BGA footprints, pads or similar stuff in this hack. If you notice, it’s “bga-LIKE” not “BGA”. What I mean is that the soldering task here is of BGA level i.e. the differential pairs, (A+ & A- and B+ & B-) are as close to each other as the solder balls on many BGA packages. Maybe I’m exaggerating it but this one is difficult for sure. That’s basically what these modules were designed for (they usually come with a copy of Windows 10 installed since the seller can’t erase the drives themselves). You could crack the existing OS on it easily enough to work on different hardware though I’d rather just stick a lightweight Linux distro on it. I’ve been able to boot the included Windows 10 installation on other PCs without issue. Interestingly enough, if I desolder the eMMC and stick it in an SD card reader, it will boot just fine despite the reader enumerating as a removable disk (normally Windows doesn’t allow it). I have a couple of linux computers running on 8gb with space to spare, built a couple of years ago when a SSD was a lot more expensive. But recently when I look at alternatives to a 2.5″ SSD, they cost more and take more work. 120gb seems to be the sweet spot right now for computers with low storage needs. Yep, just got 2 120GB SSD from NewEgg for $18.99, not bad. Some days ago I bought a 250G SSD for like 54€. It’s a little more expensive, but considering, that you need two cables and two PSU adapters for 2*120GB it seems worth it. One could always try running an older OS. I had always thought of Genera as an OS, not something to run on an OS. A few gigabytes is enough to allow your choice of OS(not just ones designed to play nice as PXE payloads) to get to the point where it can use iSCSI, NFS, or similar to connect to however much storage you require(without rather expensive hardware/firmware level support for direct boot from iSCSI LUNs or similar). You see this a lot with VM hosts: 2-4 socket box with 256+ GB of RAM and it is booting off a couple of SD cards. Why? Because ESXi, KVM, or Xen have to bootoff something; but not much of it, and all the real storage work is done outside the box. Seems like a waste of time when you can buy 240GB SSD’s for around $24 right now and prices keep falling. Depends on country. Around here, a 240GB ssd costs around 70 to 90 US Dollars. If those $12 are cheap for him, then it is a cheap way to get a couple of almost-disposable drivers for testing . Also, the “just because” factor. you might want to check again, prices went down suddenly. Not so suddenly, since I just checked. They didn´t fall so much in the last minutes. Different countries, remember. 240GB for 24 USD ? where that ? are you sure it´s not a mistake ? If they were that cheap, I’d be running a RAID array of them. *Built for the peculiarities of Flash. Just checked eBay, USA sellers only there’s a bunch of 240GB SSD for that cheap. As eBay buyer, you’d be protected so if it turns out to be a 128MB SSD reflashed to show up as 240GB but fails h2testw (or F3 for MacOS and Linux) you get the money back. I didn’t check if those were the good ones that can saturate SATA 3 bandwidth at over 500mb/sec or if they are the cheap slower ones that compares to speed of mechanical hard drives. Be aware that the cheap SSD might not have DRAM buffers (faster wear out, less speed) to cut cost. I would not buy SSD for any thing critical from a vendor that doesn’t manufacture their own FLASH chips. The ones that do aren’t much more expensive for those sizes. Some of the cheaper ones might substitute FLASH with the lowest commodity prices without warning. So some batches might be worse than others. Maybe he only did that to test his own skills (like reverse engineering) or to sharpen them further. And that is what it’s about. Mentioning dollar figures is irrelivant to me. Quite often I end up spending far more on a hack than buying stuff (excluding time doing it) – but I do it because I love it. Sorry I meant 120GB but I have recently purchased 240’s for $39. I recently bought Crucial MX300 “275GB” (256GiB) for about $40 US. It has LPDDR buffer and uses Micron FLASH. Yes, although with about 54€ for 250GB SSD (Samsung EVO860) I paid a little more. Perhaps I could have selected a cheaper brand, but for me it was OK.
+1 for going through the effort to figure something out and learn how it works. That’s the heart of a tinkerer and I love it. -several thousand if anybody thinks this is a good solution for a daily driver. The prices on bottom tier SSDs have fallen like a rock recently. Even without the hackiness here, this is _not_ a good deal on the memory. Reputable SSDs can be had for less than $25 US for 120GB from reliable sources. At the moment, Amazon has Kingston A400 drives, the 120GB version is $21.99. I’ve seen equivalent deals from other vendors and brands in the last month as well. The company I work for sells a 32Gb SSD (to customers) for more than the recent price I saw on a 1Tb SSD elsewhere. I wouldn’t laugh it off like that. For SSD, there are differences between FLASH chip quality in wears, data retention and how good the controller they use, DRAM buffer and how they handle wearout. It seems the time he spent was for the purposes of enjoyment and learning. If you look at this strictly from an economic point of view, his time was worth more than the cost of new drives. So, the purpose here isn’t to save money, although I praise the actual purpose. you could argue that if he bought one of those, but “I purchased them” suggests he got at least a few = $ was a motivation. If you had a bunch of these, I’d say the best way forward is to make up a PCB with the connectors on ’em. That magnet wire job, while impressive, is hard to repeat. That said, it’s a neat hack and as someone who routinely goes negative on cost-time ratio, appreciated. cheapest brand new proper SATA 2.5 32GB SSD is $17 in a corner shop near me in EU today. Net hack, but totally not worth it just as is, maybe if you can get your hands on super cheap big eMMCs like the blog post hinted at the end. eMMC is not the same as SSD, but can actually more be compared with a SD card – the controller is in no way as rugged as a “real” SSD drive, wherefore there is a high risk of data loss or even disk crash in case of a power failure. Depends on the emmc and the SSD in question. For example swissbit has emmc with very rigid specs. Your time is worth something, can’t zero that out. It’s great for skills acquisition, no denying that, but utility doesn’t move much beyond that unless he chains them together to form something more useful. Author of the original blog post here. Lots of good commentary – I like that! This hack definitely wasn’t savings-oriented apart from (good) bare eMMC having a poor $/GB ratio compared to SATA SSDs nowadays – $70 USD for an eMMCv5.1 128GB is common on markets like AliExpress and so on (one exception was the slow $2-6/64GB ones I got and blogged about before: https://ripitapart.com/2016/10/28/emmc-adventures-episode-1-building-my-own-64gb-memory-card-with-a-6-emmc-chip/ ). I was mainly in it for the cheaper eMMC chip itself and the eMMC-to-SATA bridge is effectively an unlockable bonus. I just enjoyed the challenge of taking a previously-unknown pinout and figuring it out myself, and this adapter I built was a means to an end. In fact, most of the things I blog about are done from a time-rich-money-poor perspective. eMMC reliability itself has been pretty good, although certainly not without its issues. I do have a handful of bricked eMMCs that I’ve still held on in hopes of being able to reuse them as raw NAND Flash if I’m able to figure out the pinout – something worthy of a blog post in itself. In my experience, Samsung eMMC chips brick more easily than eMMCs from other vendors. Your projects have always been interesting, do not mind the naysayers. This is Hackaday, not buy-a-day. It it works, and it you got it working “just to do it”, then that is a very good reason in itself. Also, that would be a way to recover data from these SSDs, in case of the original crapbook failing. And as for reliability, I have seem ssds failing or dying, just as normal hard disks. There are always better brands / parts and worse ones, and even the best brands have their share of failures. Amazon sold me some 120 SSD drives for $25 last month. They seem to work fine..
*rhetorically* have you been able to hack them in some way? or is this just an interstitial ad + review? But, converting a thin client HP laptop with a 4 gig chip, to a full fledged Windows 10 machine is a “Sorta” hack. I hope power and data pins show up as reverse-biased (ESD protection) diodes, because otherwise the connected chips are going to draw bucket-loads of current. Quite a few years ago we had a problem with mis-packaged (180 degrees out of position) chips, effectively reversing power and ground pins. Those *did* act like forward-biased diodes, and the magic smoke didn’t stay inside for long! They do not necessarily have to be mispackaged. One time it was sufficient, that I get the orientation wrong wehn I placed the chip on the solder cream. Luckily I used a current limited PSU.